Eternal Orthodox Church calendar for the 11.11 year 2017. She was born in Rome of well-born parents and left an orphan at the age of three. As an orphan, she was taken into a women"s monastery near Rome, where the abbess was one Sophia, a nun of a high level of perfection. After seventeen years, Anastasia was known in the whole neighbourhood, to the Christians as a great ascetic and to the pagans as a rare beauty. The pagan administrator of the city, Probus, heard of her and sent soldiers to bring her to him. The good Abbess Sophia counselled Anastasia for two hours on how to keep the Faith, how to resist flattering delusion and how to endure torture. Anastasia said to her: "My heart is ready to suffer for Christ; my soul is ready to die for my beloved Jesus." 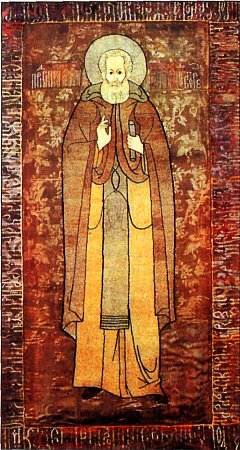 Brought before the governor, Anastasia openly proclaimed her faith in Christ the Lord and, when the governor tried to dissuade her from the Faith, first with promises and then with threats, the holy maiden said to him: "I am ready to die for my Lord, not once but - oh, if it were only possible! - a thousand times." When they stripped her naked, to humiliate her, she cried to the judge: "Whip me and cut at me and beat me; my naked body will be hidden by wounds, and my shame will be covered by my blood!" She was whipped and beaten and cut about. She twice felt a great thirst and asked for water, and a Christian, Cyril, gave her a drink, for which he was blessed by the martyr and beheaded by the pagans. Then her breasts and tongue were cut off, and an angel of God appeared to her and upheld her. She was finally beheaded with the sword outside the city. Blessed Sophia found her body and buried it, and Anastasia was crowned with the wreath of martyrdom under the Emperor Decius (249-251). Under pressure from his parents, Abraham married, but on the very day of his wedding, he left his bride, his parents, his home and all that he had and went off into solitude to live in strict asceticism. He lived thus for fifty years, only leaving his cell twice in the whole of that time. Once it was at the command of the local bishop, to convert a pagan village to the Christian faith, and the other was to save his dissolute niece Maria. He entered peacefully into rest in 360, at the age of seventy. From the village of Paraora, in the province of Kessana in Thrace, he was married and had two daughters. His wife was seized by the Turks and converted to Islam, and, in order to save her from the harem, he also pretended to become a Turk. Saving his wife, he gave her to a women"s monastery and went off to the Holy Mountain, first to the Lavra and then to Esphigmenou. 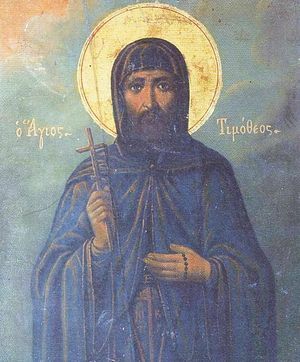 He desired martyrdom for Christ, like Agathangelos of Esphigmenou, and was beheaded in Jedrene on October 29th, 1820. 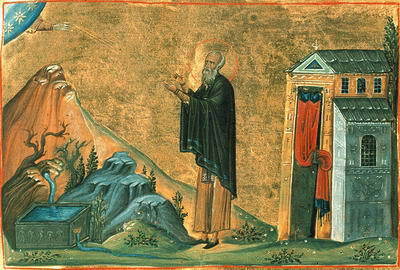 His body was thrown into a river, but his clothing was taken back to Esphigmenou by the elder Germanus, his spiritual father. 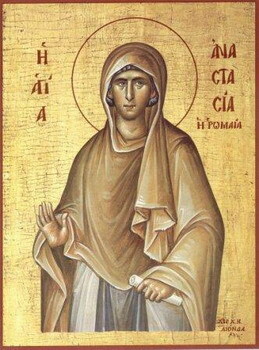 The Nun Anna and her son Saint John lived in Byzantium, and Saint Anna was the daughter of a deacon of the Blakhernae church in Constantinople. 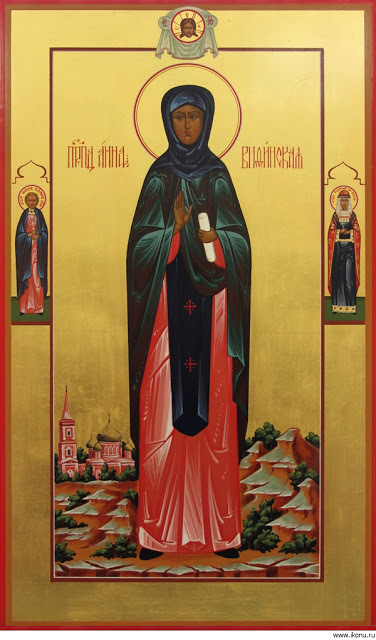 After the death of her husband, dressed in men's clothing and using the name Euthymian, together with her son Saint John she began to pursue asceticism in one of the Bythinian monasteries, near Olympos. 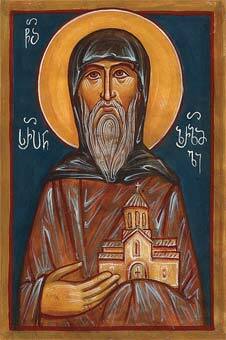 The Nun Anna died in Constantinople in 826. Her memory is celebrated a second time on 13 June.